1. “Frogging” – Im going to start with this one, because when I first saw it I was thinking to myself “what on earth does that mean, that is so flipping weird”, of course I carried on and saw it time and time again over the coming days, I eventually made the correct assumption that it meant to tear up a project and start again. A search on google revealed the origin of this term…Frogs make noise that sounds like “rip-it, rip-it” and when we are pulling apart our beautiful knitting we are ripping it, hence the ‘frogging’. Personally I think it will take some getting used to saying that, for me it still sounds strange. 2. Sock and Shawl obsession – I have something I need to tell you all, and I’m pretty embarrassed about it…….I have never, ever, made a sock. This never used to bother me, If I’m being honest, I never thought socks were a great thing to knit. Why? you ask? Well, simply, nobody sees them, they sit in your shoes and I imagine they take a long time to knit, I wouldn’t know though, would I! Anyway my ‘sock-world’ view is being challenged, all since joining Instagram. They are everywhere. 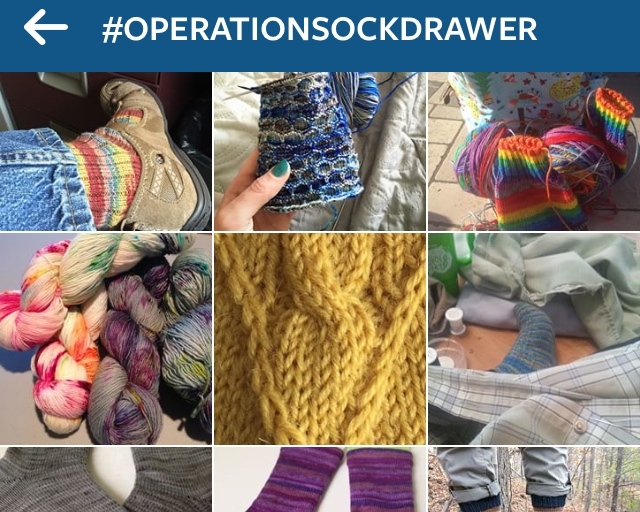 There is even a hashtag #operationsockdrawer. If you haven’t checked it out, do, its sock city! The other thing dominating my feed is shawls, the most beautiful shawls I’ve ever seen. Once I made a “shawl” for my mother in law, its pretty much the kinder-garden finger painting version of the art work I see on Instagram. So today, I am making a pledge to do both and I will post them on this blog, what I need from my readers is advice on the two patterns you think I should use. I feel these will be important initiation projects into the knitting community. 3. Russia, Sweden, Denmark, Norway, Germany…… These knitters are elite and I console myself with the fact that its flippin’ freezing over there and this is probably why. Is knitting part of your school curriculum?!?! Im seriously asking that! Because you are amazing! 4. Having just said all that, I have a very patriotic announcement to make, I think I’ve officially found the cutest baby patterns, which of course are made by OGE Knitwear Designs (If you haven’t seen already you must check out her designs) and she’s Australian!!!!!!! I just bought my first ravelry purchase which so happened to be her Baby girls A-Line dress with bolero and rompers. 5. So much love to give – This online knitting community is full of love, @suze1965 you were my first Instagram follower and two weeks later I have 250 followers, all of who write beautiful comments and encouragement on my projects every day, I’ve never been more inspired to knit, share, teach, learn and create beautiful things. So thank you all for continuing to support and inspire me, I am loving every minute of this journey! ps. the cover photo is from @happyspider6 she has an epic drawer full of socks, she’s from Canberra #australiaknittersrepresent and has an awesome podcast called Happy Spider Knits Podcast. But afther this it took years until I took up knitting again and then in maybe 12th grad I decided to knit a pair of socks for a good friend of mine whoes shoe size was 46!!! Luckily my mum knit the heel and toe and I only did all the stockinet, still this put me off from knitting for years again until last year I decided to stop buying clothes and make my own and in this started a massive fair isle blanket first and then a jumper for me and so much more! Oh Lottie thankyou for your comment and for sharing your story!! Your knitting now sounds very impressive! Ich könne ein bisschen deutsche sprechen, ich habe es in die Schule gelernt, aber ich denke mein deutch ist schwer weil ich habe es alles vergessen!